40V Brushless Attachment Capable String Trimmer is rated 4.8 out of 5 by 125. Rated 5 out of 5 by lccm5960 from string trimmer edger combo used it for the first time this weekend and I was able to trim and edge the whole yard on 1 battery charge and still had one bar showing on the power meter. very satisfied on the performance and ease of using this tool. was skeptical about going from a gas powered trimmer to a battery powered trimmer but now I'm convinced there was nothing to be afraid of. this thing has power to spare and does a better job than the gas powered unit it replaced. 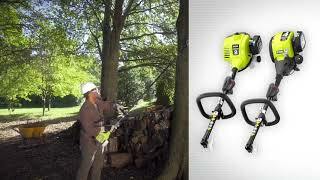 I am looking into getting the pole saw and blower attachments now after seeing the power this has. 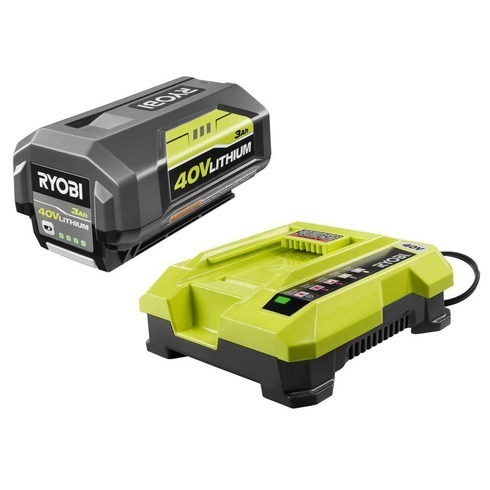 I would recommend this to anyone who is on the fence about switching from gas to battery powered units. 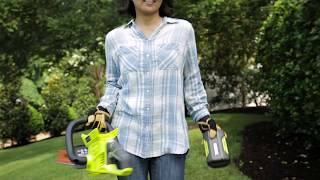 Rated 5 out of 5 by Christine 48 from Freedom This Ryobi string trimmer has given me such freedom to move in and around our yard, garden and pool. Before, I used an electric trimmer that really limited the distance I could trim and was such a hassle to drag the cord around with me. Later, I tried a gas trimmer but didn't like the aggravation of keeping gas on hand and often had difficulty with the pull rope getting caught and not being able to start the engine. 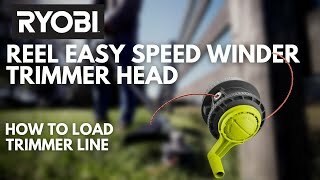 This Ryobi string trimmer operates with such ease. The string is so easy to replace and best of all, after the battery is charged I am ready to hit the yard running and nothing holding me back. I will definitely be a life-long Ryobi customer! Rated 5 out of 5 by lawman87xx from Finally, True Gas Power from Ryobi! 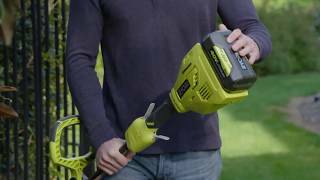 I originally purchased the 40v standard string trimmer and I was somewhat disappointed by its power. I returned it and go this new model. WOW! This is was i was expecting! SO much more power and speed. I actually run my trimmer on low and not even full throttle (throttle feature is nice). I cant wait to try it with my pole saw attachment and soon to get cultivator attachment. I have hoards of Ryobi tools and their performance prompted me to get into their outdoor lineup, after a near miss with my first purchase I am very pleased to say this is what I was looking for. I would put power very much on par with gas and without the weight/fumes/vibration it wins hands down. I might suggest they include a should strap for the unit,its lighter than gas but still could use a should strap IMO. Rated 4 out of 5 by Ronrut from 40v String Trimmer First Use First use today after purchase. Did two yards, two driveways, two fence lines, around two houses and one outbuilding. Only skipped the street edge, didn't need it. About one hour of use, battery was on last leg when finished. Did every bid as good as my old electric, without the hassle of the cords. Still experimenting with balance so my arms don't get so tired. WOULD GIVE FIVE STARS IF SOMEONE COULD TELL ME HOW TO LOG INTO MY ACCOUNT. SET IT UP, REGISTERED THE PRODUCT, GOT A CONFIRMATION EMAIL, THEN LOGGED OUT. CAN'T GET BACK IN. AND YOU HAVE TO HAVE AN ACCOUNT AND LOG IN TO GET HELP. CATCH-22! Rated 5 out of 5 by Spidman from Very light! Nice trimmer if you like power without the headaches of a gas trimmer...I also have the Blower 40v and I can use the battery from that too...So when I'm using one, the other is charging. Seems to last 45-60mins on the 2.6ah, (Which it came with.) and last about 15- 20mins longer on the 3.0ah battery from my blower. I like it! Rated 4 out of 5 by GDAWG from Good but not Great I purchased 3 Ryobi tools over the last month or so and the string trimmer is my least favorite. I have used the 40V string trimmer several times now and I have two complaints. One is I have to be very careful how I hold the trimmer or my legs will get blasted with debris. The guard needs to be bigger or at a different angle to fully block debris from being kicked back. The other complaint is that I am trimming St. Augustine grass and it has a hard time cutting thru the longer strands or runners of the grass. Rated 4 out of 5 by Limegreentoolz from Good, but... It was bought to accompany our mower; It was getting lonely and the Gardena trimmer wasn't playing nice with it. That and the commonality of the 40 could system was the clincher. The trimmer is powerful, it will edge like nobodies business. The battery longevity is very good and easy to remove, charge, installed and go. However. The string used is brittle. And.. It is very difficult [frustrating] to advance the string with the "auto advance" feature, something that still cannot be accomplished; anyone listening, "IF YOU KNOW HOW TO DO THIS PLEASE CONTACT ME WITH THE INSTRUCTIONS". Having said this, I would recommend this device and I don't regret purchasing it; well maybe just a little. Rated 5 out of 5 by GJames from Easy to use Bought this last week. Easy to assemble and easy to use. Good power. It is best to fully charge it before using it the first time. So far I haven't replaced the line yet but it looks like that will be easy. A bigger guard perhaps adjustable would be great. 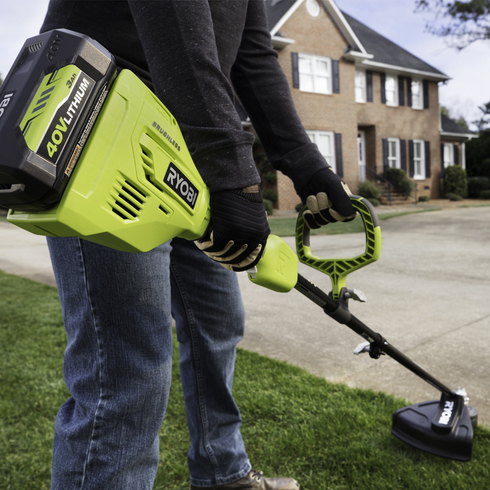 The RYOBI 40V Brushless Attachment Capable String Trimmer delivers GAS-LIKE POWER™ without the hassle of mixing oil and gas. 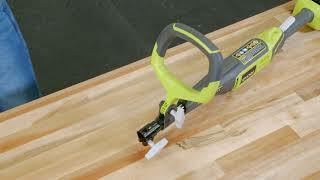 Compatible with all RYOBI EXPAND-IT™ attachments you save time, money and space. This new trimmer delivers increased torque and line speed for powerful cutting. It also comes equipped with a variable speed trigger amd two-speed switch making it easy to controls. All backed by a 5 Year Limited Warranty! Cutting Widith: 13 - 15 in.